However, I have fallen in love with the Peter Pan collar which is popular with the school uniform shirts supposedly giving the sense of eternal youthfulness…. umm yeah. Now that I’m a full fledge adult, I can forget about that eternal youthfulness but the adaptation of the peter pan collar offers a classic and simple look. 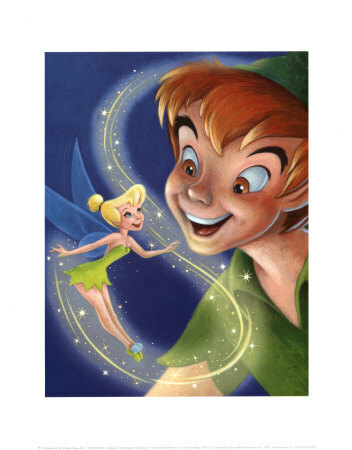 Now that I think about it… Peter’s shirt collar was the standard point collar.. so it makes me wonder where the term Peter Pan collar originated… ummm. After making this jacket and loving the collar, I knew I wanted another one. 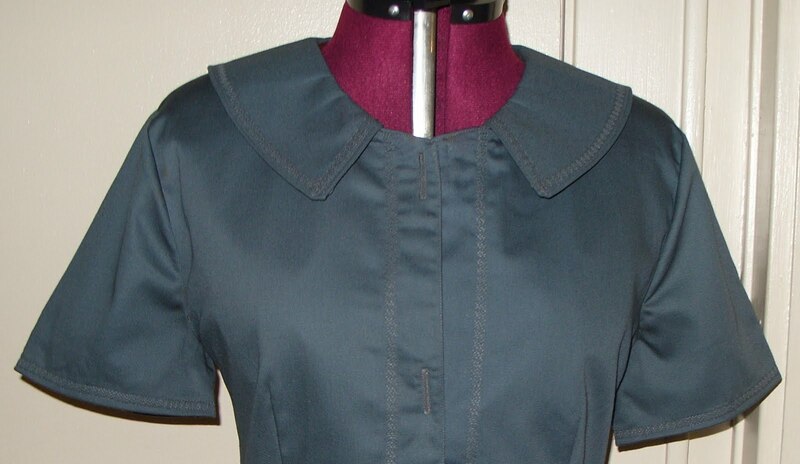 In an attempt to give B5147 a reprieve, I used Butterick 5235 See & Sew, which has a peter pan collar. I'd cut this pattern a little over a month ago, along with a skirt and pants to make a suit, well I finally got around to sewing the jacket. Butterick 5235 Jacket has front and back darts, collar and three-quarter length sleeves. I used a teal/blue/gray polyester cotton which during the construction process was full of love & hate. When I purchased the fabric I remember the color being a blue/teal, however, the fabric was purchased last year at Wal.mart and it could've been the lighting. I tried the jacket on several times in different lighting and in certain lighting it looks like a prison gray, another it looks blue/gray and sunlight closer to a teal/blue/gray.....go figure. Regardless of the color issues, the fabric is a charm to work with and a detour from knits... for now that its. Sewing this jacket is part of my 2010 Goals, which is to sew suits. Being an avid lover of suits and haven't purchased a suit in over a year - can I say I am fiending for a new suit. Yeah, I know I made a suit with the V. Wang Charcoal Plaid, but I want short sleeve jackets. Although I've made jackets prior to this one - I can't bag a lining to save my life (I would spend an exorhibtant amount of time playing mobius - turning the garment in and out through that itty-bitty sleeve opening and not progressing). In the end I'd wind up doing some foolery to get the lining inserted and incurring other obstacles (prime example of foolery - the lining was too short and had to add lace to lengthen it). Despite all the foolery, luckily the garments have been wearable, but knowing I need to get a better handle on it. I worked on this jacket all week, paying careful attention to the lining insertion instructions. The lining for this jacket is done via the armhole rather than bagging thru a tiny hole, albeit still entails pulling the garment through a hole, but a bigger hole nonetheless. I pinked all the seams allowances and to keep them flat stitched over each side. 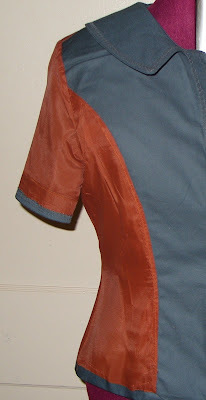 Most of my garments have double stitching which you can see along the back seam. I noticed some of my suits have double stitching, but not sure if it serves the same purpose as mine since the garment is lined. The process was easier for me but I ended up busting a stupid move... look closely at the sleeve the fold of the lining is the wrong way. It should've been folded towards the inside abuttng the fold of the fabric sleeve which would've only required one line of stitching to attach both, but since I'd used double-sided adhesive tape (a PITA to remove from lining fabric) I had to stitch the lining fold, then handstitched linining sleeve to fabric .... yeah typical foolery moment. Another note to self remove baste stitching from lining pleat. A few of my Loft suits have subtle decorative stitching and thought I'd try my hand at it... decorative stitching along the collar, sleeve and front. I still need to add the buttons and wanted your opinion about these... which were considered prior to the decorative stitching..
Until then have a beautiful Sunday..
Ooh, that is gorgeous! 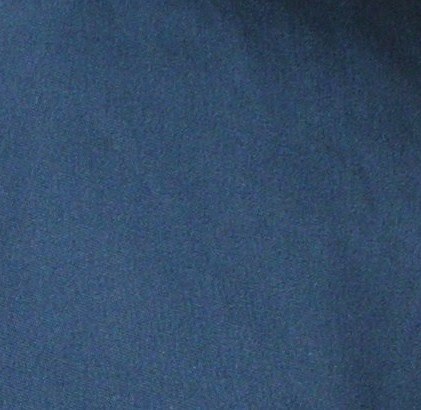 The color looks blue-gray to me, not prison gray, and those buttons pick up the blue and look great. The shape is so nice - can't wait to see the finished one on. Love your dec stitching too. So one sleeve lining boo-boo that nobody'll see - I wouldn't have picked it up at all - nice work! Wow, that is going to be a great suit! Wonderful suit and the decorative stitching really looks fantastic. I like the buttons, too. Wow, very nice jacket. I have never really made a jacket out of a pattern. Looks very nicely made. Aaaaaaaaaaaand PERFECTION !!! I love it ! I love the jacket and I am a big fan of peter pan collars. Your stitching is a nice touch. I topstitched a plain black panelled skirt yesterday for the same reason. The buttons are perfect and give it a lovely zing. Do you plan to wear a top under the jacket or wear it buttoned up? I think you'll be able to match so many prints to this fabric. That jacket is awesome, the decorative stitching really makes it pop, love the buttons. Thank You. I've not started on the skirt yet which has been cut out for a while now and just a matter of baste stitching to check fit. Hopefully after cleaning, laundry and cooking, I should be able to at least baste stitch it. @ Carol: The jacket will be worn open. Actually I can't remember the last time I wore my jacket closed, which means I need to make a tank. Your question jogged my memory - Thanks... need to check fabric stash for a top. LMAO! Tks for your comment, if it doesn't fit you must aquit hilarious. Ohhhh, that jacket is looking gorgeous! I love all the details you added. It really makes it pop! Jacket looks great - the decorative stitching suits it quite well - as always, you'll look like a knock out in it!! I like it. I am always drawn to those type of colors. (you know the ones you cant really call one color another - blue-gray) Anyhow I am glad to know I am not the only one who resorts to foolery when completing projects! LOL!! The top stitching really looks good and makes the jacket. Cant wait to see the skirt you picked. Go Sheila, nice job on that lining and the decorative stitching turned out beautiful. I cant wait to see the whole suit when it's done. Wow! That's looking great Sheila! Looks great so far! I really like the decorative stitching~!! Wow. That is beautiful! Plus, I love that you photographed the whole thing coming together. Enjoy wearing it! I love the color - whichever color it is. Can't wait to see the whole finished suit. Regarding your issues with bagging linings, have you ever tried doing it and leaving a wider opening at the bottom hem, and not trying to pull the jacket inside out by that sleeve opening? I hated doing linings too until I changed the way I did it, and now I'd rather line everything than have to do such a neat job on the inside. Let me know if you don't have a reference with those lining instructions in, I've got them somewhere and would be happy to scan them for you. I can't wait to see the whole outfit modeled by you! You created a practical and lovely addition to your wardrobe! You are Vogue-worthy in the entire ensemble! Sheila, what a great outfit on you! This is really really cute and I love the color contrast with the lining and jacket fabric too! Wow! Looks so good!!! The stitching makes it look so expensive!